Recently I was refused an E-2 visa under Section 214b. To be honest I don't really know why because I have strong ties with my home country (house, bank account, family) so my lawyer sent an appeal to the legalnet and I'm waiting for an answer. I have a second nationality that I used to travel in USA within the last 15 months under ESTA. A few days after my E-2 refusal I checked my ESTA status and it is still authorized. Can I travel to the States right now or not? I have a purchased business over there and have to take care of my assets. Every alien shall be presumed to be an immigrant until he establishes to the satisfaction of the consular officer, at the time of application for admission, that he is entitled to a nonimmigrant status. For this reason, your qualification for ESTA is suspect and it can be voided at your entry by an immigration officer. I will strongly suggest you address the E-2 visa problems you have through your lawyer because like you said, you're coming to see to your business which is WORK and ESTA does not allow for work. Currently immigration is a hot issue and in flux in the USA, and nonimmigrants and even immigrants are facing a lot of uncertainty regarding their status, don't risk it. Not the answer you're looking for? 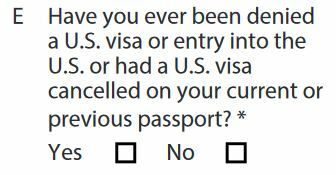 Browse other questions tagged usa esta us-visa-waiver-program dual-nationality or ask your own question. Entering USA under VWP for 3 weeks and continuing to CAN for a 3-month stay? Which visa to apply for visiting USA when working with/providing a service to a USA company? Can a dual national use VWP with one passport when they have a valid US visa in the other (non-VWP-eligible) passport?